A solar-powered, eco-friendly villa, Perfect Villa will not disappoint and just like the name suggest it is, in fact, perfect for a getaway with your near and dear ones. 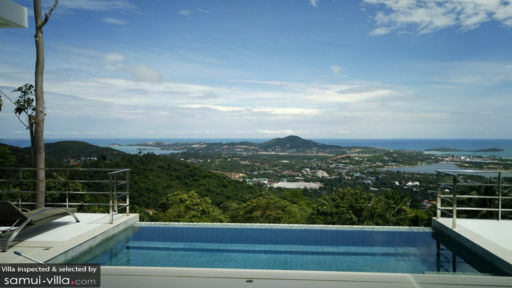 This three bedrooms property on Bo Phut beach, Samui, is mesmerising and pristine. All-white interiors and elevation exemplifies the cool and calm ambiance of this entire space contrasted splendidly with the azure waters ahead. A stunning infinity swimming pool overlooks rolling, green hills and the ocean glistening under the hot, tropical sun. 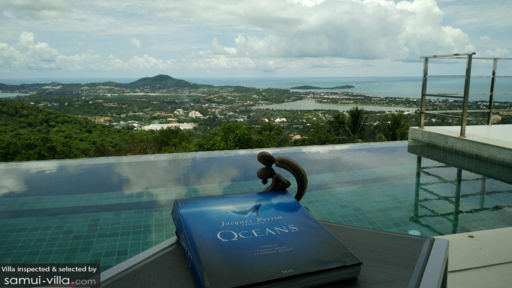 Here in Samui, a beautiful and memorable retreat sits in wait for you and yours. Three unique bedrooms are found at Perfect Villa, each opening out to the pool deck for easy access. The bedrooms have been designed with natural stone platforms for queen-sized beds fitted with comfortable mattresses. Equipped with modern amenities such as air-conditioning, the bedrooms are comfortable and you will settle in without any hassle. Each bedroom has an en-suite bathroom that is open plan towards the bedroom. You can head out to the large terrace as well for taking in a breathtaking view. 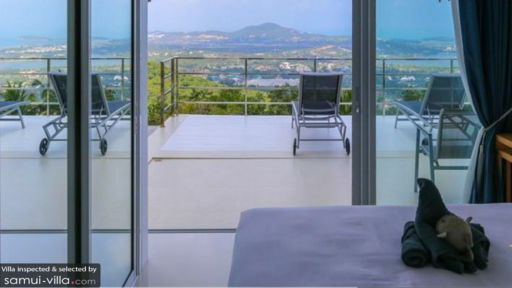 The modern and minimal Perfect Villa is distinctively edgy with its stainless-steel fittings marked with whitewashed walls and a white sun deck. The 6-metre swimming pool with its majestic infinity edge is everything you need for this tropical getaway. A panoramic view greets you bright and early in the morning as you relish the scenic beauty while lounging in the pool or on the sun chairs on the deck. Enjoy a breakfast in the open air on the alfresco sitting area or relax with a good book on the chair swing. The poolside living area opens out to the deck and the stunning view through sliding glass doors. The room is awash with shades of white with decal prints on the wall depicting trees, some floral artwork, and antiques that truly bring character to the room. A comfortable sofa has been placed in the room so you can kick back and relax while also taking in the spectacular view. A high-vaulted ceiling maximises the room and provides ample ventilation and natural light to stream indoors. The dining area is placed in the centre of the room wherein guests can enjoy a hearty feast prepared by a villa chef or yourselves with everyone. The setting is intimate and definitely relaxing so you can cherish these moments spent with your loved ones. A fully-equipped kitchen occupies the corner of the room with natural stone countertops and separators along with modern amenities and equipment for your use. There are plenty of services and amenities on offer at Perfect Villa including a team that comprises housekeepers, pool maintenance, gardener, and personal guest assistance. Some special services that are charged extra include car/boat/scooter rentals, babysitters, personal chef, and massages. The villa is located in the mountain at 200m altitude and requires a car or minimum 1.8-liter power to drive up the steep road. It takes 5 minutes to drive from Chaweng main road and around 15 minutes drive from Bo Phut beach which has many restaurants and beach bars. Enjoy a yoga session or a day at the spa for a fulfilling time or head to one of the local eateries such as Secret Garden or Zazen for a taste of authentic Thai food. Some sightseeing is mandatory and the Big Buddha on Bo Phut is the perfect spot.